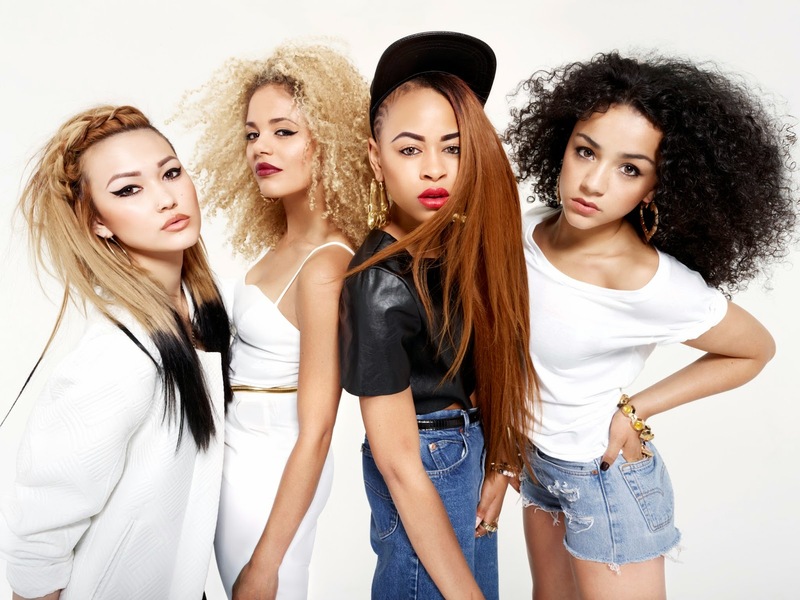 SnapCacklePop: Interview - Neon Jungle..! Asami welcome to SnapCacklePop, when you coming to our great country? I loveeeeee Australia so much!! It's one of my favourite places, I haven't yet been *laughs* but I have always heard such amazing things about it and I love Bondi Rescue haha! So your name Neon Jungle – please explain, is it because you like bright colours and you are slightly wild? Neon Jungle came from a song we had recorded when we had no name and it is now actually going to be our third single. It is called Welcome to the Jungle and we really liked the word jungle but we thought we needed something to go in front of it as jungle didn't sound right on its own. We thought we'd try neon in front of it, not necessarily meaning bright colours but we all individually have bright personalities! So Shereen, Amira, Jess and Asami, how did you girls get together? We got together through auditions which were held in London, Shereen and I were found on Youtube, Jess was found waiting for her sister on Brick Lane in London and Amira was found shopping in Westfield. And what makes you different from other Girl groups like Little Mix & The Saturdays? Before being in Neon Jungle I could easily compare two girlgroups but now I can see how we are all so different from one another, we all have that something that makes us special and I think what makes us different is that we don't wear the same outfits or do synchronised dance routines, which is good as I can't dance! So you are really a non-typical girl band, why break away from the typical girl band pop mould? I think we wanted to break away from that to be something fresh and be wild but I don't think we intentionally meant to do that - it's just us! So your new single Braveheart is rocketing up the iTunes … tell us about it? That makes us so excited, it's crazy! It's a feel good song and I feel like it's quite summery and it just makes me personally want to party and just have a laugh. It has such a mix of genres through out, how would you describe it? I don't think I could describe it but if I had to it's a clubby track with essence of techno but also has that bass to it too. Is this “sound” what we should expect from an album? The album is very diverse, it has a variety of sounds, one track you might like the next your nan could possibly like! Well the track showcases each of you vocals brilliantly, is it important that each of you get to show yourself? Yes it is important, but we still have so much more to show. Braveheart is a good representation of a side of our voices. I am half Japanese so we wanted to include that but also we wanted something before the drop to create a climax sort of! What is your love of Cheese including Cheddar and Feta in a rap? Haha we thought it'd be cool to just add something that people would talk about and ask why are they rapping about salad?! But it was written with the producer who is American and thought it was fun to add some American slang. Why do you love pop music? Pop music can make you feel so many different emotions, but who doesn't love pop music?! Which artists have influenced you to create such a unique sound? We all have such different music tastes but it's funny because none of mine are anything like the music we make but I enjoy it so much! My influences are Foo Fighters, Red Hot Chilli Peppers, Dido and Alanis Morrisette so as you can tell they aren't really Bravehearty! You have had a massive response on YouTube to the video, how have you felt about that? It's incredible!!!!! The response has been so much better than I could have hoped and we are all so excited to see where it goes to as I feel like it has a long life ahead of it haha! So what’s planned for the rest of the year? Hopefully travelling around the world and meeting new people but also the album will be out soon so hoping that does well and we just have loads of festivals coming up as well in the summer which is going to be fun. OF course coming to Australia too!! 1) What is your idea of a wild night out? 2) If you had to compare yourself to a wild animal of the jungle what would it be and why? 3) Who do you have a secret pop crush? 4) If you had to take on fellow UK girl band Little Mix and The Saturdays in a Hunger Games battle would you win and what tactics would use ? 5) If you could be a superhero what power would you have and why? Neon Jungle, thank you from all at SnapCacklePop, we love you and we wish you every success in this crazy world of pop and can’t wait for the album. Braveheart is available on iTunes now..!